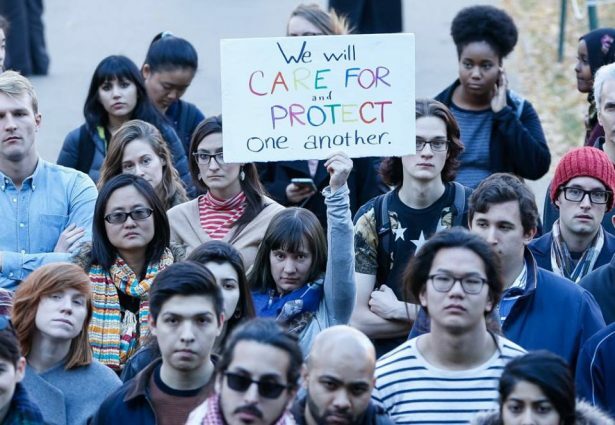 In the wake of Trump's election, thousands of students staged walk-outs on over 80 campuses for “sanctuary campuses” to protect immigrant students. In wake of the Trump’s election and the president-elect’s renewed vows to deport 2 to 3 million immigrants, organizers across the country are mobilizing to create “sanctuary spaces” for those threatened by the proposed crackdowns. On Wednesday, thousands of students staged walk-outs on over 80 campuses nationwide, signalling their commitment to maintain “sanctuary campuses” to protect immigrant students. Demonstrators also presented their school administrations with specific demands, including commitments to refuse campus access to Immigration and Customs Enforcement officials, continued support of the Deferred Action for Childhood Arrivals, or DACA, program, and the protection of students regardless of documentation status. Saavedra says that while many communities may be affected by the election of Donald Trump, many immigrants, particularly those in the undocumented community, feel “they may be first on the chopping block.” Saavedra worries about his own brother, a DACA “Dreamer,” who may be “one of the first to go” if Trump makes good on his promise to repeal the DACA program. 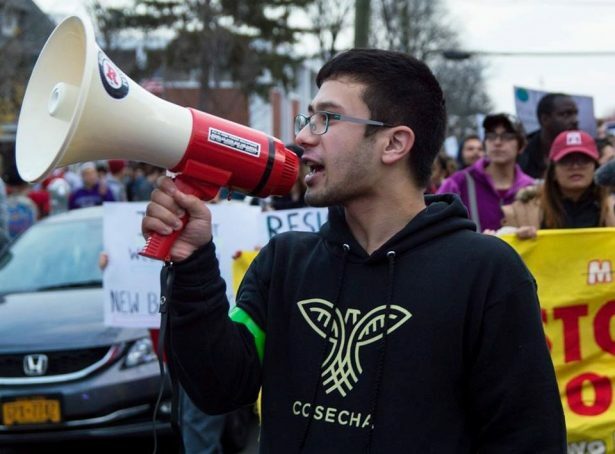 Cosecha has already overseen numerous direct actions to both combat anti-immigrant policies and to elevate the visibility of immigrants as a part of the American social fabric. Under the slogan #HechoPorInmigrantes, or “#BuiltByUs,” Cosecha launched a campaign to highlight the role of immigrant labor in the United States. Cosecha has taken particular aim against Donald Trump’s use of undocumented workers, including his employment of 200 unauthorized workers in the construction of Trump Tower for a wage of $5 a day. More recently, Cosecha has worked to raise awareness about the “Buffalo 25,” a group of undocumented workers who — earlier this month — were abruptly rounded up and detained during a restaurant raid in Buffalo, New York. In early November, Members of Cosecha occupied Hillary Clinton’s campaign office in Pittsburgh to draw attention to the 25 detainees, calling on the then-presidential nominee to commit to protecting the rights of the detainees and their families. Today, Cosecha is working to gather 100,000 signatures for its petition for a targeted boycott. Organizers hope that leveraging consumer power on a mass scale will “break the anti-immigrant consensus that has solidified after Trump’s victory.” Organizer Vera Parra told Hyperallergic “we trust that when the immigrant community uses its economic and labor power to show the broader public what this country would really look like without immigrants, legislation will follow.” Saavedra agreed, saying that while his community is shaken, “there’s also a real sense of resiliency. We’ve been through pain before, and if we can stay serious and organized, we will figure this out.” If done right, Saavedra said, “this could be an opportunity to redefine the country. If some colleges and cities so much want to keep all those illegals, they can start to pay all expenses from their own pocket! Why do we have to pay for illegals education? Tomorrow these illegals will replace our children on workplaces! Some American students do not understand that all these illegals their direct competitors! Then, they will understand it when they after graduation from the university will start looking for a job! Our American students are so stupid and naive, they do not understand the truth of the life, when they play in democracy like an immature children! I think, all sane parents should explain to them, that education of illegal students will be paid from the pockets of parents of American students and after graduation, they will be a COM-PETI-TORS!!!!! One should not be naive. I live mostly in Kenya and it is very difficult for a Kenyan or other African to be admitted to a US University even if they have the funding, scholarship, etc. The immigration services turn down many, if not most of those applying. This has been going on for decades. Trump may make this worse but he will only be toughening up procedures that already are in place. If the students can’t get to the US in the first place, they have already been discriminated against.